While smartphone shutterbugs are content applying faux analog looks to images prior to sharing on social networks, traditional photographers specializing in portraits or beauty shots demand a subtler approach. For example, an otherwise great shot might be spoiled by a less than perfect complexion, or tired eyes that require more touch-up skills than you can muster. There’s now a better way to click your way to the perfect portrait shot, even if your Photoshop or Lightroom skills aren’t the greatest. But you’ll want to spring for the complete plugin bundle to get the most value from this software. Athentech Perfect Eyes ($49) and Perfect Skin ($59) may be sold separately, but the way they work is virtually identical. 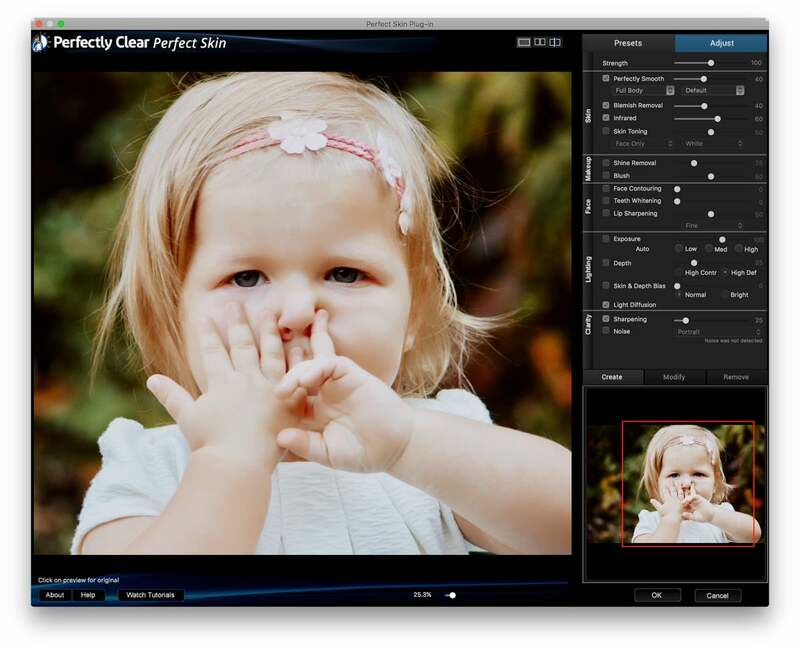 These are not standalone applications, but rather plugins that work entirely from a new window inside your preferred host software; in this case, Adobe Photoshop, Photoshop Elements, or Lightroom. 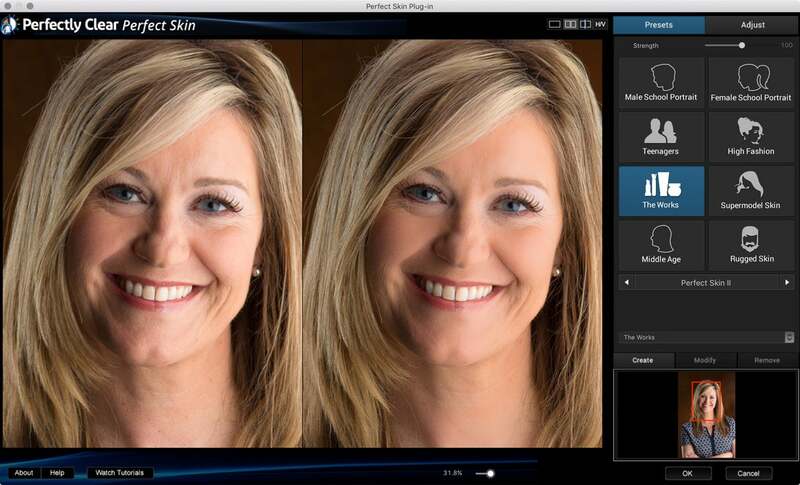 Perfect Skin adds virtual makeup to make everyone look their best just by selecting a built-in preset. Thankfully, a single license works with all three apps on two Mac or PC computers. Sadly, there’s no extension support for macOS Photos, although you can use the clever External Editors for Photos ($1 on the App Store) to roundtrip images in a pinch. The developer also markets a line of five extension apps on the Mac App Store — LUCiD Color, LUCiD Details, LUCiD Exposure, LUCiD Eyes, and LUCiD Skin — that delivers much of the same functionality. To get started, open an image file in your host software, apply the desired Perfect Eyes or Perfect Skin filter, then select from a grid of built-in presets. After applying a preset, you can optionally switch to the Adjust tab to toggle certain options on or off, or make precise adjustments using sliders. But I found this wasn’t required most of the time. The existing presets cover most common scenarios, although advanced users will appreciate having more control. Custom tweaks can be saved as new presets for later use, which appear in a pulldown menu along with the built-in options. The left-hand preview window can be toggled between full, two-up, and split-screen views; clicking this preview temporarily switches back to the original as a quick comparison. There’s also a navigation preview, used to shift the view once you’ve zoomed in for a closer look. The Intelligent Auto setting in Perfect Eyes does a great job of accentuating a subject’s eyes in just a few clicks. Perfect Eyes offers eight presets: Intelligent Auto, Morning Coffee, Raccoon Eyes, High Fashion, Good Night’s Sleep, Gentle Children, Natural Catchlight, and Eagle Eyes. Most are fairly self-explanatory and do a bang-up job of automatically eliminating red-eye, removing dark circles, and otherwise accentuating the subject’s eyes. Perfect Skin doubles the number of built-in presets, with options for adding healthy glow, softening pores, applying virtual powder, or clearing up the subject’s skin. A second bank of presets are designed for male or female school portraits, teenagers, and those with rugged skin. Intelligent Auto generally produces a nice middle ground, and the Strength slider offers a quick way to increase or decrease the impact of a chosen look. In addition to the presets, Perfect Skin offers advanced control over each setting from the Adjust tab. Each plug-in does a fantastic job of not going overboard. If you prefer a delicate touch you can easily dial back the results, but the tools are there to produce less natural looks when needed. For images with a single subject, you don’t even need to select or mask off the affected area; plugins are automatically and intelligently applied, so great results can be had in a few clicks. Photos with multiple subjects are a little trickier. Perfect Skin usually works fine since its algorithms have a more specific target, although finer details might not receive as much attention without selecting smaller areas before applying the plugin. Perfect Eyes, on the other hand, works best with one pair at a time. Both plugins produce immediate results, but the UI tends to be a bit sluggish when opening or closing. While I can’t recommend these plugins highly enough, I’d strongly consider investing in the $149 Perfectly Clear Complete. instead. In addition to Perfect Eyes and Perfect Skin, this bundle includes Perfect Exposure, which delivers similar one-click magic to make any photo look its best without using multiple tools or tweaking a variety of settings. Does your subject have dark circles under their eyes? 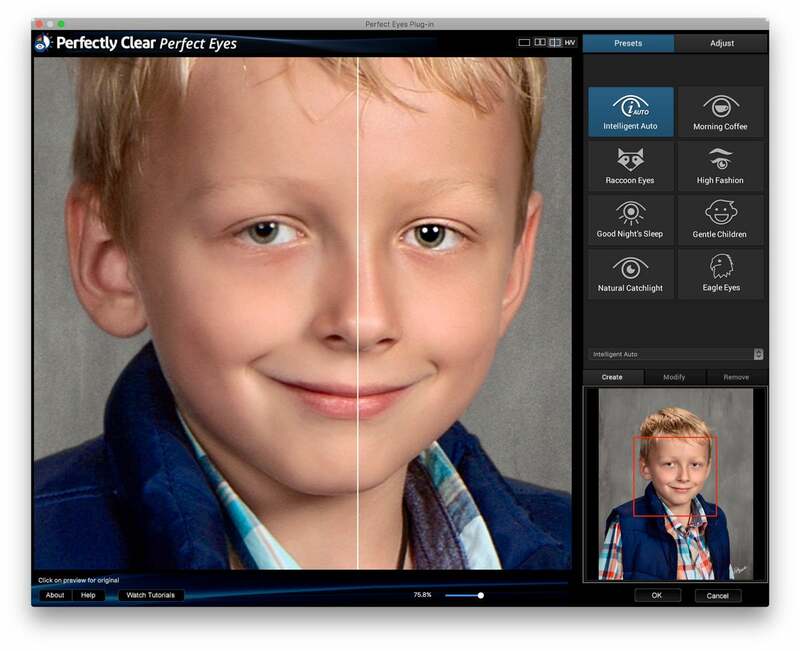 Athentech’s Perfect Eyes has an enhancement just for you. 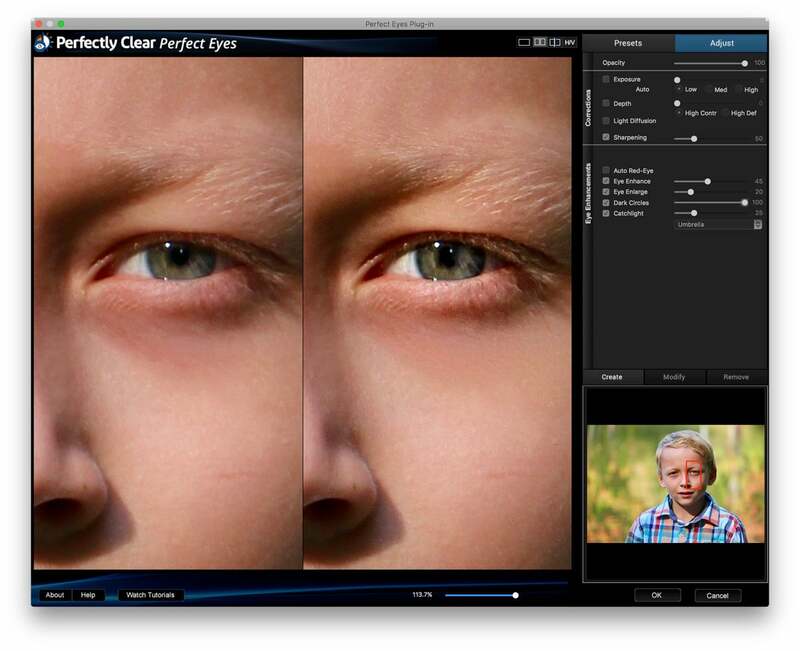 Athentech Perfect Eyes and Perfect Skin make any subject look like a professional portrait, but skip the individual purchases and go straight for the complete bundle instead.